Why the Map central market district is your guide. The map central market district came about, as it shows Mercado Central for the Tenerife capital on the bottom left. You can also call it the Santa Cruz map which is correct too. 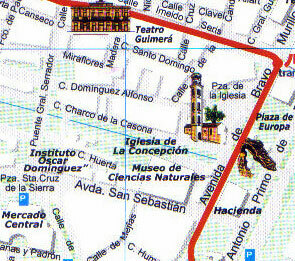 Map Central Market district of the capital of Tenerife. This Map Santa Cruz depicts five more attractions in the immediate neighborhood of the Mercado de Nuestra Señora de Africa. Steps lead down to La Noria from the bridge of the Lions. Teatro Guimerá is just around the corner in Calle Santo Domingo behind Church Iglesia de la Concepción. 20-30minutes to Auditoria Adá Martin. Select the other direction along the seaside and reach the famous opera house by a gentle walk. Just now discover why the big Santa Cruz Tenerife main market is a must see for everybody. Otherwise, you can go to Google maps and find help to get from one place in the capital to others with its GPS directions. You can also get this service from outside Santa Cruz the Tenerife capital. From map central market district back to Tenerife maps of all sorts.